The House voted 217-185 Thursday evening to approve a measure to keep the government open and provide the Trump administration with $5 billion in funding for the construction of a wall along the U.S.-Mexico border, putting the onus on the Senate to avert a shutdown. 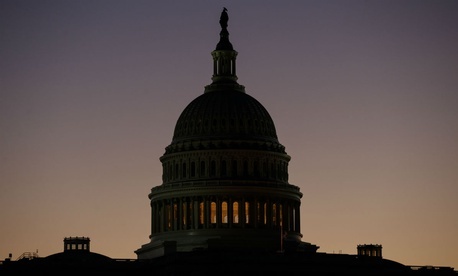 Congress and Trump have until midnight Friday night to enact a spending package representing roughly one quarter of discretionary spending or there will be a partial government shutdown. Among the federal entities at risk of shutting down some or all of their operations are the departments of Transportation, Housing and Urban Development, State, Interior, Agriculture, Treasury, Commerce, Homeland Security and Justice, as well as other independent agencies. The bill passed by the House would provide $5 billion in wall funding and $7.8 billion in disaster relief, and would extend appropriations for unfunded agencies until Feb. 8. Earlier on Thursday, Trump again changed his position on how to fund the Homeland Security Department, telling House Republican leaders that he would not sign a bill that lacked wall funding. Last week, he insisted he would be “proud” to trigger a government shutdown over the issue, but as recently as Wednesday he had signaled he would sign a “clean” continuing resolution. A number of senators, whose chamber passed a clean CR Wednesday night, had already left Washington by the time the House voted. Senate Majority Leader Mitch McConnell told lawmakers to return to D.C. for a vote around noon Friday. But the pathway to averting a government shutdown remains in doubt. Senate Democrats have vowed not to support any measure that provides more than $1.3 billion in general border security funding, which likely will doom the House’s bill. And even if the Senate rejects the House version and the House votes Friday to approve the Senate’s CR, Trump could veto the legislation. Although Trump was scheduled to travel to his property at Mar-a-Lago Friday, White House Press Secretary Sarah Huckabee Sanders said Thursday that he would remain in Washington in the event of a shutdown.